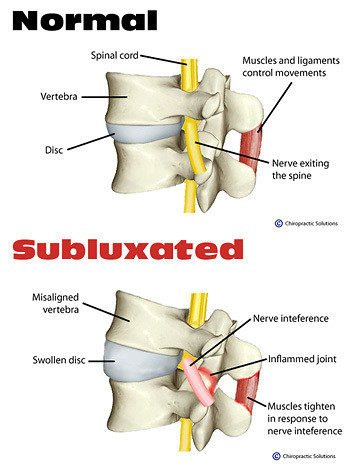 A vertebral subluxation is defined as: a misalignment of one or more of the vertebrae in the spinal column, which causes alteration of nerve functions and interference to the transmission of mental impulses, resulting in a lessening of the body's innate ability to express its maximum health potential. Also referred to as spinal nerve interference. These spinal misalignments have been documented in hundreds of research articles, and range in incidence from the birth process (both mother and child), to the growing years, all the way through adulthood and into old age. Literally anything that causes adverse stress to the joints of the spine can lead to a vertebral subluxation. A chiropractor is the only doctor who is trained to detect and correct vertebral subluxations. » Click here to learn more about The Vertebral Subluxation. » To view these simple tests, follow this link A Self Examination for Nerve Interference.